There are clear winners and clear losers when you look across the history of video game franchises. Some winners undoubtedly deserve their accolades, the perfect combination of charm and gameplay (looking at you, Mario!) Sometimes the winners becomes losers in the long run as their reputation becomes tainted by lackluster followup titles (looking at you, Duke Nukem!) Sometimes the losers become winners in the long view of history, misunderstood gems that flopped before an uncomprehending audience only to become fully appreciated after death (looking at you, Psychonauts!) And sometimes, the losers undoubtedly deserve their lumps (looking sternly at you, E.T.!) And then there’s the vast middle between winning and losing, where the majority of franchises rest, a deep breeding ground of arguments about the pros and cons of each title creating a less objective, more personal list of winners and losers. Pick Axe Pete! is in this middle, and I for one think that’s a shame. Pick Axe Pete! was released in 1982 for Magnavox’s Odyssey 2 system. 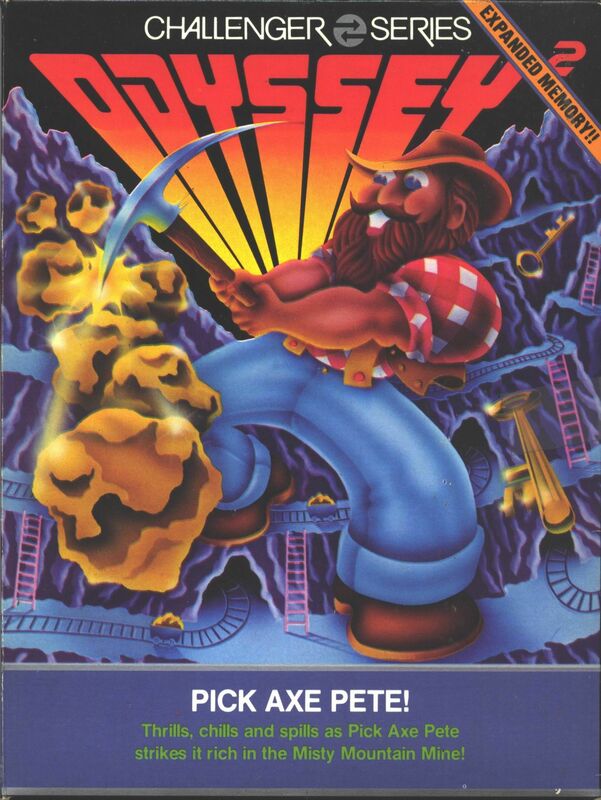 The titular Pete is a miner who descends into an ever-deepening maze. Boulders of gold cascade down and Pete has to either smash them with his pickaxe and claim the gold or dodge them when his pickaxe breaks. The deeps reward Pete with more pickaxes and keys, the latter allowing him through one of three doors to descend deeper into the maze. Points are awarded for successful dodges, claiming gold, and accessing keys. The maze goes on forever. Pete is doomed. The level layout is clearly inspired by Donkey Kong. Past that, though, the game is pretty unique; I guess you could make a strained case that the boulders and the barrels are similar. Regardless, the fidelity, sound and speed are impressive for a 1982 title, so it’s a little frustrating that this effort was basically it for Pick Axe Pete!. Many less-deserving ideas got sequels, many less-aesthetically-appealing concepts made it into the higher-concept 8-bit era, so why not Pete? My guess is the console to which it was tied. 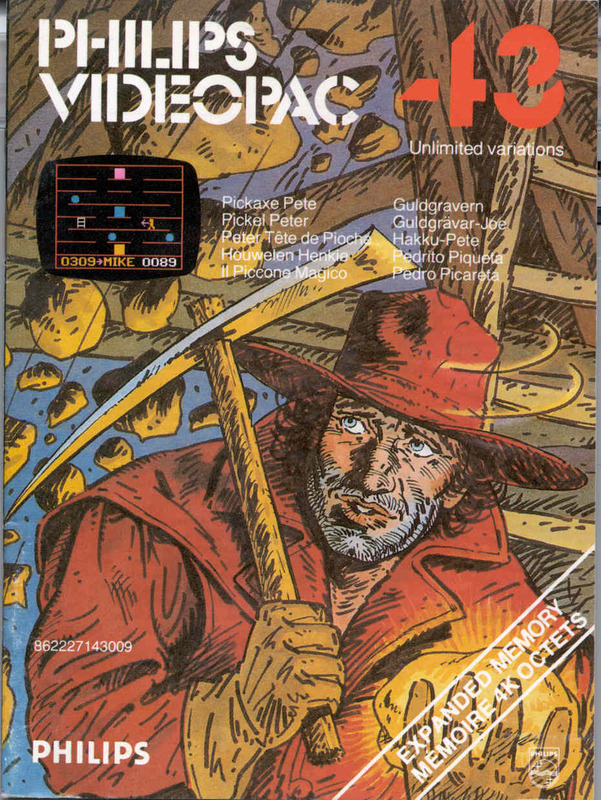 The Odyssey 2 wasn’t a disaster when it came to sales, but it didn’t do gangbusters either. In the years just before the 1983 video game crash it was probably pretty easy for a title to get lost in the shuffle, especially when the console that carried you was getting lost in the shuffle, too. But hey! There WAS a cool competition for Pick Axe Pete! that took place at the 1982 World Fair, and awarded the winner a pound of gold! Poor Pick Axe Pete!, left behind in the annals of history. Maybe tonight, when you’re playing the latest game from a well-worn franchise on your fancy 4k console with full dialogue and surround sound and online multiplayer, maybe pause for just a moment and pour one out for old Pete, forever descending into a maze of obscurity.